We are blessed with so many stunning river and stream subjects of great variety in the UK, and whatever the weather may throw at us there is something truly pleasurable to sit beside a bubbling brook or fast-flowing mountain cascade. These features can also make excellent lead-ins to an interesting focal point, and there is something almost lifelike in a moving stream. In this watercolour I’ve played down the actual river, to concentrate more on the surrounding forested hills and the large crag on the right. By introducing a lot of mist I’ve simplified the background, although there is still much detail visible. With a river or canal it will add a sense of mystery and interest if you have the further part of the river turning round a bend – we are all eager to see what’s round the bend! For the misty effect use plenty of water and build the scene up gradually, dropping the blue-greys or green-greys of the distant trees into a damp area to create lovely soft edges where tree masses appear and disappear into the mist. 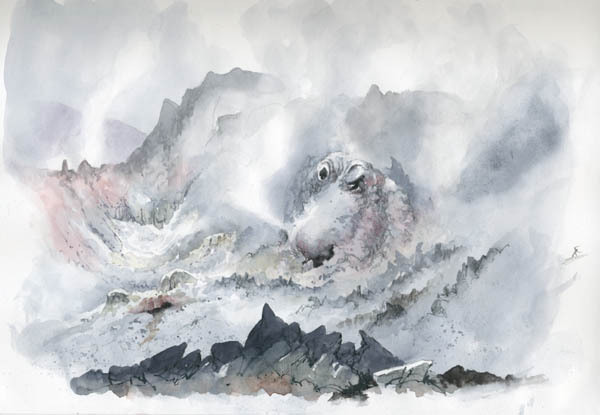 By placing hard-edged forms with strong tones such as those just above and to the left of the crag, in front of misty passages you will create a powerful sense of depth in the painting. 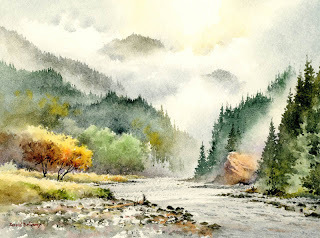 If you really want to give your landscape paintings a boost one of the most effective methods is to inject a strong dose of atmosphere into the scene. Unfortunately most of the time when you sketch or photograph a subject there may not be much by way of atmosphere, so in many cases you need to inject it into quite an ordinary scene. With time and experience this becomes easier. In this view of the Teign estuary in Devon you can barely see the distant Dartmoor ridges, and even then they become lost in the atmosphere at the extremities. 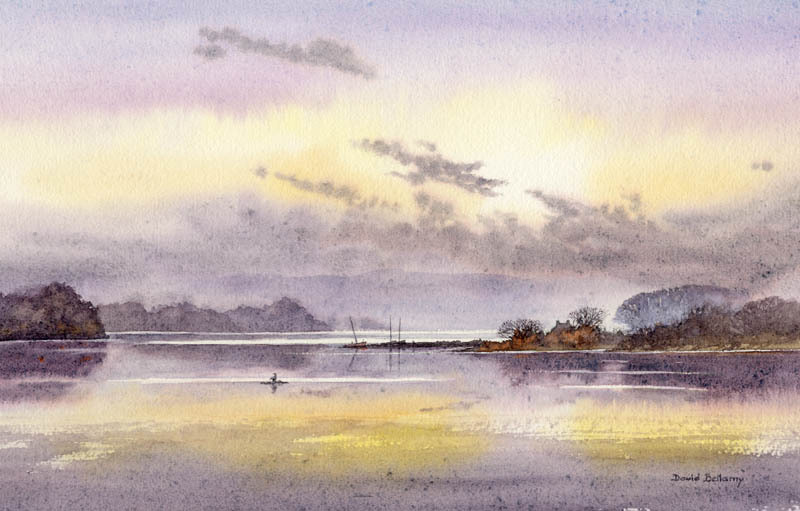 To achieve this sense of mood and distance I have used the same wash for the ridges as I have for the lower sky area. Keeping most of the edges softened also helps create mood, as does a very limited palette. There is hardly any detail in any of the background trees and promontory, and even the centre of interest – the cottage with its attendant trees has little extra colour. This painting is part of my forthcoming exhibition Shorelines and Summits at Lincoln Joyce Fine Art, 40 Church Road, Great Bookham Surrey, KT23 3PW – telephone 01372 458481 Their website is www.artgalleries.uk.com The exhibition runs from 28th October to 7th November. Both the coastal and mountain scenes include strong atmospheric effects in most cases. There are still places available at my seminar which takes place from 10 am to 3 pm on 28th October in the Old Barn Hall opposite the gallery, so you can also view the exhibition. Tickets are available from the gallery or Clockwork Penguin or telephone 01982 560237 The seminar comprises a watercolour landscape demonstration and an illustrated talk, both covering how to include animals and wildlife in your paintings – and, of course, lots of atmosphere, and you will have the opportunity of asking questions. I hope to see you there. 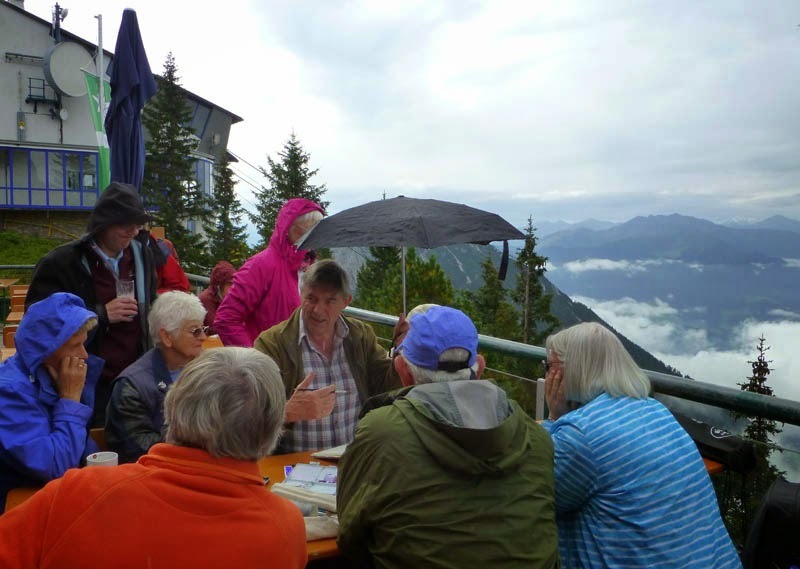 Jenny and I have just returned from Austria where we took a group to paint Alpine scenery. It was a great trip, with many memorable scenes, despite rather a lot of cloud and mist. So we had rather a lot of practice in rendering misty mountains in watercolour! Here I’m doing a watercolour demonstration way above the clouds, with marvellous views all round as the mountains rise out of the inversion. Alas, there were even more clouds above us, so we did get a little rain near the end of the demo, but not enough to spoil things. A cappuccino and an apple-strudel quickly restored morale. Mist on mountains can, for the artist, sometimes be both magical and a misery. I love the way it can blot out unwanted features, but as we all know, it often blots out the very features we want to see! There are a number of ways of creating mist in watercolour. 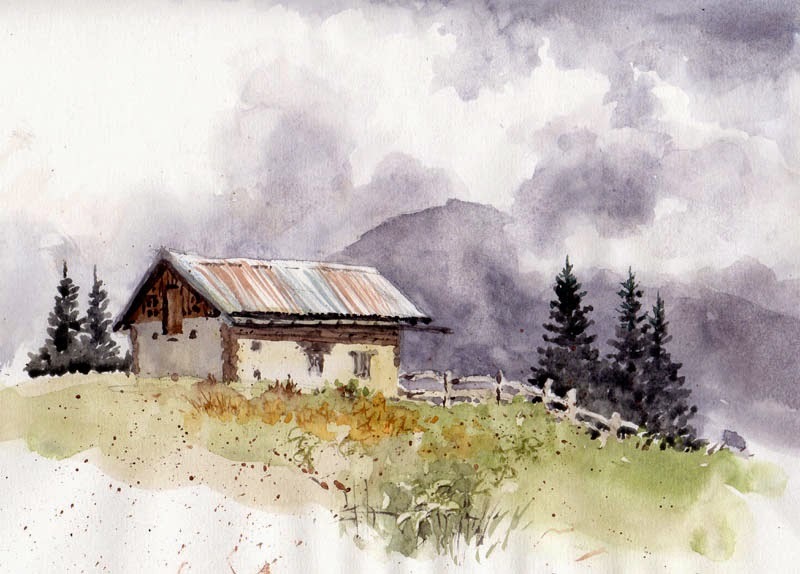 In this scene above the Inn Valley in Austria I ran colour into wet areas to create soft edges to the clouds. I had to work quickly as I was painting on a cartridge book. With such a lot of cloud edges, inevitably some dry hard-edged before they can be corrected. This is not usually a problem as they can later be softened with a damp brush when the paper is completely dry, though the odd hard edge here and there might well enhance the clouds. Alternatively a soft sponge is an excellent tool for softening off, but take care if you use cartridge paper as it won’t stand too much surface friction. Enjoy your clouds! I’m only just dragging myself out of that Christmas sloth, not encouraged by day after day of pouring rain. Where is all that lovely snow? Anyway, thanks to all of you who send us Christmas greetings. It was much appreciated by Jenny and myself. My art year has started with an article in Leisure Painter Magazine and 2014 rings up another milestone: I’ve been writing articles for Leisure Painter for the last 30 years, and it has been a marvellous relationship with some great folk. So the painting I am featuring here is part of that article, although I shall now be discussing a different aspect. 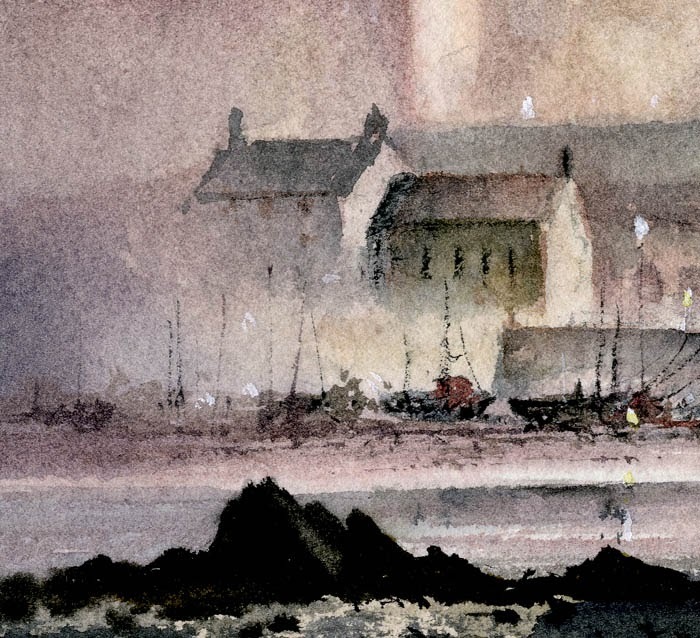 The picture shows a small corner of a watercolour of Tenby Harbour at dusk. This is a magical time to capture images, as the atmosphere tends to be more accentuated, and you are less likely to overdo the detail as so much of it is lost in the atmosphere! Although in this instance I could actually see more detail in the buildings, I deliberately avoided putting in too much, and in fact simply laid a weak wash over the lower parts so that the suggestions of masts and boats would stand out more. At such times shapes run into each other, often creating a sense of mystery, so going out in search of subjects when you can hardly see them might at first sound rather perverse, but it does teach you a very powerful lesson in creating mystery and atmosphere. When she was young, Catherine my daughter had a video film which featured a Lava Demon skate-boarding down a river of molten lava, a great favourite with both of us. On the recent painting holiday to Iceland I met another, less dynamic lava demon in the great lava fields of Leirhnjukur, and of course just had to sketch him…..at least I assume it was male. He was about 60 to 80 feet high and belched steam out of his nostrils, as you can see in the watercolour sketch below. Whether or not you wish to seek out the odd lava demon, the technique for rendering the steam emerging from his nostrils is just the same as for mist on mountain-tops or circling round crags: I normally use the wet-in-wet method, firstly liberally wetting the area where the steam or mist will appear, and a little way beyond, and then brushing in the colour of the mountain, rock or crag to shape the mist as required. You shouldn’t have much water on the brush when you apply this colour. Sometimes I need to reshape the misty effect a little, and I do this as quickly as possible with a clean, damp brush, before it has a chance to dry. Note the undetailed shapes of rocks near the steam, and how they contrast with the strong darks of the strident foreground rocks. Enjoy your hunting/sketching, but don’t fall down any of those nasty steaming holes.